Kuhl Wave, under jockey Bryan Ernst, winning the $32,400 Cherokee Bonus Challenge Stakes at Will Rogers Downs Saturday afternoon. CLAREMORE, OK�OCTOBER 18, 2014�Coming off a second place effort in the Grade 3 Two Rivers Stakes on October 4, Kuhl Wave was a game winner Saturday under jockey Bryan Ernst in the $42,400 Cherokee Bonus Challenge Stakes at Will Rogers Downs. Redneck Sis finished three-quarters back in second with Dreamnwideopen was another neck behind in third. Owned-and-trained by Miguel Banuelos, graded stakes winner Kuhl Wave completed the 300 yard course in :15.547 seconds, a 95 speed index. 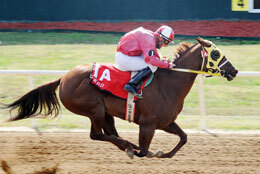 The $19,200 winner's purse boosted the 4-year-old filly's career earnings mark to $192,298. Tom Bradbury and Marvin Willhite bred WAVE CARVER daughter in Oklahoma from the Shazoom mare Shazooms Doll. Her record stands at 28-7-4-6. Also a multiple stakes winner, Redneck Sis picked up $6,720 for owner/breed Jack B. Wilson and trainer Bonnie Wilson when she finished second. Randy Wilson had the riding assignment. The mare has earned nearly $136,000. Sam Green owns Dreamnwideopen, a 4-year-old bred in Missouri by Sunflower Supply Co. The Guillermo Valdivia trainee earned $3,300 for her third place effort. Cody Wainscott was riding. Aguila Jr and Win Rabbits Fly completed the field.